As you all know, I love to support sustainably made brands, but more specifically Canadian-made brands! When Tense Watches reached out to collaborate, I was so excited! I particularly like their hashtag, #mypresenttense as I think it really suits my pursuit of intentional living reminding me to slow down and be more present. Being active on social media, I often have to find a proper balance with my time. Thanks Tense Watches, for giving us all a gentle reminder to be present. I'm happy to share a bit about the brand and why I love it. 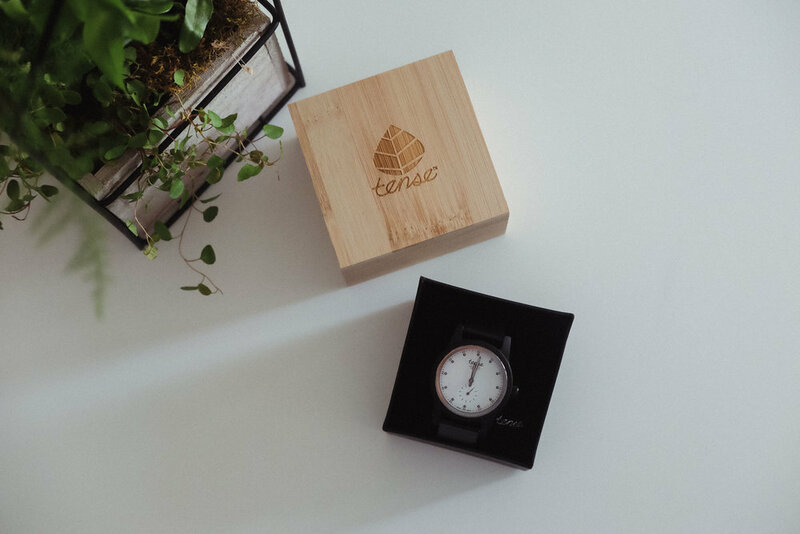 Tense Watches are beautifully designed high-quality wooden watches made from 100% recycled or reclaimed wood, all manufactured by hand in their workshop in Vancouver, British Columbia, Canada. The watches are powered by Rondo 6004D Swiss Movement or Japanese Miyota Watch Movements. I love that Tense Watches are built around their core beliefs in quality and craftsmanship first established in 1957 by Ken P. Lau. I was able to customize my watch to my specific style, so I chose a watch that was more robust and masculine looking because my other watch that I own is more delicate and feminine. I chose a Hampton North dial, an Black Oak case, and black leather strap. Some things I noticed about this watch is that it is very lightweight and because of the colour combination, it matches with almost all of my outfits! Below I've styled the watch with a very minimal but casual look. I tied a dark navy button down over a classic black maxi dress, paired with some strappy black sandals. Thanks again Tense Watches for this beautiful, sustainbly-made watch! Friends, if you're in the market for a new watch and want to support an excellent Canadian brand, be sure to check them out. Disclosure: This post is in partnership with Tense Watches who graciously gifted this watch to me. All opinions are my own!